I have been asked several times to write about my choices for the local and statewide judicial races. Stan Stanart, the Harris County Clerk, recently told me of his sample ballot that allows voters to enter their name and address on his website and produce a personalized sample ballot; so, I decided to give it a try. Stan and his team have developed a program that allows each voter to create their own unique slate to post and send to friends. Think of it as Stan’s way of overcoming the slate machines. And, when you think about it, Stan has revolutionized the way we can share our selections. Running the election operations in the largest county in Texas always makes Stan and his guys the smartest guys in the room. They do a great job. You will notice I left many unopposed judicial races blank. I do this to send a message. The message is clear for the Criminal District Judges – I am tired of you supporting Judge Susan Brown as the Chief Administrative Judge of the Criminal Courts – think Goforth, the runaway grand jury, Constable Victor Trevino, judicial bypasses, and Devon Anderson. I have intentionally left them blank, which will show up as an under vote. This sends a message. I, of course, skipped Devon Anderson. You will notice that I voted for Stacey Bond. She got my vote for standing against prosecutorial misconduct in her court. I also voted for Rick Green over Paul Green for Place 5 on the Texas Supreme Court. I do like what has happened at the Texas Supreme Court, especially concerning the City of Houston cases like HERO. I previously wrote about Jim Leitner for Harris County Attorney. It makes no sense for his opponent, a five-year lawyer, to represent Harris County in all civil litigation and advise Commissioners Court. Jim is the only choice. Create your own ballot, print my ballot, or use something else entirely. Most importantly, VOTE! Study the candidates and, if you do not know them or the issue, do not feel compelled to vote in that race. On Thursday, Judge Larry Gist issued 36 findings of prosecutorial misconduct against Kelly Siegler in the David Temple murder case. I wanted to give you a little background on Ms. Siegler so the Big Jolly readers can remain the most knowledgeable folks on Harris County criminal justice issues. Kelly and the Jiggery-Pokery Gang united for Kelly’s unsuccessful DA bid in 2008. The gang existed in many forms long before 2008; but, Kelly’s 2008 campaign announcement provided the first opportunity for a public group photo. The gang photo clarifies their unification to the outside viewer. Like all gangs, there is a hierarchy. Ms. Siegler is the central figure and, generally, close proximity to the leader in the photo denotes a higher rank; although, a few things have changed since 2008. The judiciary members are not as obvious; but, they are certainly a very important part of this gang. Some judges, like Susan Brown, act as capos within the organization. The group also acts to protect other gang members or affiliates, not unlike most street gangs. The gang’s name has changed over the years. More recently, I renamed the group the Jiggery-Pokey Gang after reading Justice Scalia’s Obamacare dissent. I think the term fittingly describes this group and their operations. Jiggery-pokery: Dishonest or suspicious activity. David Temple is a difficult case because so many have prejudged his guilt based on Kelly’s facts. Heck, he was already convicted and sentenced. He was cheating on his pregnant wife and later married his mistress. It is easy to hate his behavior. But, the current issue is not about David Temple’s innocence. It is about fundamental fairness and justice. A rigged game is not justice. When the wrong man is convicted, we are all to blame. It is the responsibility of every citizen, voter, and human being to learn about our criminal justice system and make sure that justice for all actually means something. We, as Harris County citizens, need to take very seriously who we elect as DA and misdemeanor and felony judges. It cannot be a popularity contest foisted on the precinct chairs by the political consultants. The Jiggery-Pokery Gang has a history. Their affiliates have a history. And certain political consultants, like Allen Blakemore and Mary Jane Smith, are the promoters of these gang members. Why is the gang designation important? It is crucial for citizens, particularly those outside of the criminal justice system, to understand that Kelly Siegler’s actions are not an isolated incident. Kelly intentionally and purposefully withheld exculpatory evidence in a criminal prosecution. Craig Goodhart, Kelly’s assistant on the Temple trial, has been accused of similar impropriety in the Linda Carty case. Retired DEA Special Agent Charles Mathis alleges that Connie Spence threatened to question him about a fictional affair with Linda Carty. Lance Long and Murray Newman, Kelly disciples, were accused of pressuring witnesses to lie in the Antonio Williams case. Excerpt from an affidavit by Sharonda Cooper, a neighbor who testified against Antonio Williams. This is just a sampling of the prosecutorial misconduct developed and perpetrated by the gang. The Jiggery-Pokery Gang furthers their agenda in a number of ways. Remember, for the most part, these are lawyers and highly educated people operating in and around the DA’s office. Like all gangs, they use tools common to their surroundings. Here, the gang uses the grand jury system, media, courts, and certain judges to further their agenda. The DA’s office is very similar to junior high or high school; so, it is very simple for the inner circle to use their popularity and cunning ways to get their way. The group treats Kelly like a deity or party-animal homecoming queen. Nothing that has come out concerning Siegler’s prosecution of David Temple is new. 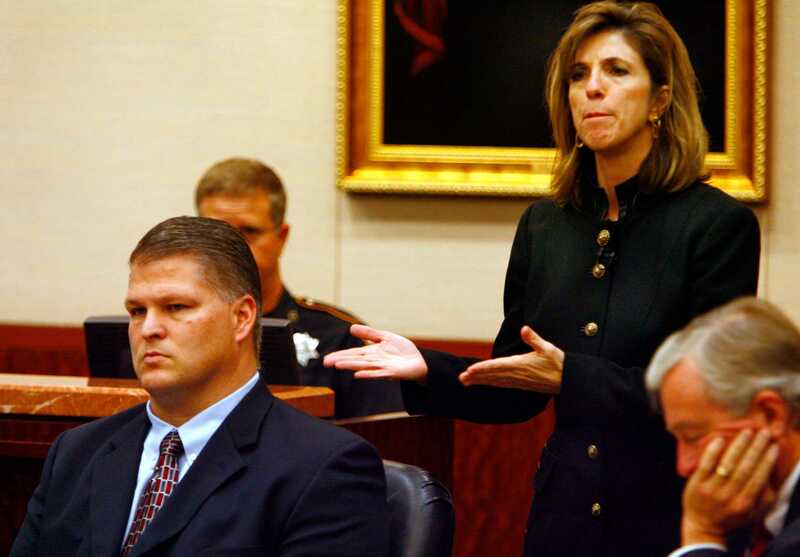 Siegler employed the exact same methods used by Ken Anderson on Michael Morton, an innocent man wrongly convicted of murdering his wife in Williamson County. In the Morton case, the prosecutor lost his law license and went to jail. The media is culpable in the gang’s rise to power. So often, the media relies on information used in their stories provided by gang members. This is an important fact because it allows the gang members to assert their narrative. Siegler carefully uses her minions to plant stories in the media, which are used to build her image and television career. Think about how often Chip Lewis, a Kelly crony, is quoted by reporters. It is a game and justice is not the goal. The win-at-all-costs mentality flourished during the Rosenthal administration. Chuck Rosenthal allowed Kelly and others to run amok. Devon Anderson promised to return the DA’s office back to the old days, which is code to the gang members for win-at-all-costs. Many members of Kelly’s crew also roll with Devon. The Lykos administration threatened to out this group and their misdeeds; so, they only had one choice: to destroy reputations. That is why, when Kelly ran for DA in 2008, Murray Newman, Kelly’s Minister of Propaganda, created a blog to perpetuate the Kelly myth. It is high time for people to know the truth about injustice in Harris County. David Temple’s lawyers have asked that an attorney pro tem or special prosecutor be appointed. This would be a start; but, as in the Michael Morton case involving Ken Anderson and the Anthony Graves case, a Court of Inquiry was formed to investigate the misdeeds on a much broader level. If you have been a reader of this blog for any length of time, you are aware of lots of misdeeds reported here involving the District Attorney’s office. It is time for the Republican Party to join with others and lead the charge to clean up the courthouse and the District Attorney’s office. Devon Anderson cancels remaining debates! Devon Anderson, the interim DA, has found herself in a position where she can no longer debate Kim Ogg and has cancelled all remaining debates. Political consultants often warn prosecutors that their trial skills do not translate well into the political arena. That is certainly true for Devon. Ryan Chandler and Inger Hampton campaigning for Anderson. When asked about the Houston Chronicle’s endorsement of Ogg, Devon claimed that she was proud to not receive that endorsement. Funny. If that is the case, why did Devon attend the Chronicle interview? Prohibit party officers from publically endorsing candidates of an opposing party in an election in which a Democratic candidate is seeking the office in question and require that such a party officer be removed. I want to commend Judge Emmett and the commissioners for unanimously voting to do the right thing for Harris County. Until today, Harris County was the only urban area of its size without a public defender office. Today, we can say that we’re taking a significant step towards following best practice models that are both economical and smart on crime,” said Senator Ellis. “I look forward to working closely with the Council to implement a plan that is efficient and ensures that indigent defendants are receiving quality representation.” Ellis began urging for the creation of the office in early 2008. “Chief Justice Wallace Jefferson is a credit to the state of Texas. He has lent his voice and the power of his office to achieving a stronger, more equitable Texas justice system for all. He has long been a powerful advocate of civil, criminal justice and indigent defense reforms. “I am delighted today by my good friend, Bill Ratliff’s decision to return to the Texas Senate and run for re- election. He is a true hero of the Senate and the people of Texas will benefit greatly from his continued service. I’m sure the people of Senate District 1 already know what an asset Bill Ratliff is to them. “Bill Ratliff is a good man who has done great things for Texas. He is a dedicated public servant who has always put policy — and the needs of Texas — above partisan politics. Bill Ratliff deserves much credit for the accomplishments of the 77th Legislature. In 1988, Rick Perry, a Texas state representative and former 1988 co-chair for Al Gore’s 1988 Texas campaign, endorsed George H. W. Bush for president. He became a Republican the next year and later became governor. In 1998, Bob Bullock, Lieutenant Governor of Texas, endorsed the reelection of George W. Bush as Governor of Texas. In 2000, Ralph Hall, a former Democratic Party U.S. Representative from Texas, endorsed George W. Bush for election as president. I didn’t know Birnberg practiced law with Andersen?